Globalization has enabled firms to specialize – and to increase the intensity of R&D, innovation and capital in their output. Globalization has made it easier for new companies to start competing with old incumbents. The trade sector has increased the number of people that it employs, both through exports and imports. Globalization helped to reduce high inflation rates in Western economies, giving consumers more “bang for the buck”. Globalization has increased real wages by lowering the cost of consumption. Many goods that previously were affordable to only the few – e.g. a mobile phone or sewing machine – are now common in most households. Globalization has spurred the spread of new technology, helping to make economies greener and more productive. Globalization has helped to reduce gender wage discrimination and giving new opportunities to women. Globalization has improved the quality of management in firms and the working conditions for people. ECIPE greatly acknowledges the support from the Confederation of Swedish Enterprise for this study. Globalization has been a boon to businesses, consumers and the Western economy as a whole. Now, however, we are at risk of having a backlash against globalization and all the opportunities that increasing economic freedom has provided us with over the past decades. There is a new anxiety running through Western societies that challenges previous perceptions about freer trade as a win-win for every country. There is rather a proliferating suspicion that globalization may have been great for some countries, but not for others, and that it is affluent countries in the West that have drawn the shortest straw. In the worldview of U.S. President Donald J. Trump, “other countries have taken advantage of America” and these types of opinions feed on growing doubts about globalization delivering better living standards for people in Western economies. Such arguments often start in China’s remarkably fast trade growth since the late 1990s, and it concludes that, while the period from then to now obviously has raised living standards in China and other emerging economies, it has happened at the expense of blue-collar workers in developed economies. China, in other words, hollowed out the manufacturing sector in Europe and North America. For some, that is also the main source of political anger in the West: recent revolts in European and American elections have been the way for “the losers of free trade” to avenge the faults of the “pro-globalization establishment”. There are deep flaws in this view of globalization. The chief one is that established fact and known economic patterns don’t support skepticism about the benefits of trade and cross-border investment. While open economies always are subject to new competition and structural changes that affects firms and jobs, the flip side of the coin is that the same economic processes create a lot of new jobs and business opportunities, and – ultimately – improve the living standards. Moreover, the new jobs that are created tend to be better rewarded and come with better working conditions. New output is often greener and thrive on new technology, leading to positive change also outside the economy. This study will take a thorough view on how Western economies have fared in the age of globalization. It will marshal a great amount of economic evidence, and combine economic research with examples from the real world that supports the age-old consensus about free trade. Its main conclusion is that the fast increase in global trade in the three decades before the financial crisis substantially improved Western economies and the living standards of their citizens. Globalization was a great force of spreading new technologies and providing new economic opportunity to labour in both developed and developing economies. Contrary to much commentary, it helped to put a higher premium on human capital and giving firms new chances to employ the staff they need to compete successfully. Since the crisis, however, globalization has stalled – and global trade has become a casualty of increasing protectionism around the world and the weak macro-economic performance of the West. Trade is not growing much anymore – and, for the West as well as the Rest, that should be a great cause of concern, not for jubilation. There are many different ways to examine how globalization has improved businesses, living standards and the performance of the entire economy. Let us start, however, with a quick primer on trade and what economists mean when they are talking about globalization. The period of globalization, between 1980 and 2010, is unique because global trade grew very fast. Obviously, international trade developed in the decades before 1980, and there has also been some growth after 2010, but none of these periods come close to the expansion of trade during the era of globalization. The same is true for Foreign Direct Investments (FDI): it multiplied by many times between 1980 and 2010. Chart 1 and 2 make these developments visible. Chart 1 is an index of global exports – or how global exports have grown – between 1800 and 2014. In rough terms, trade growth was low and flat for about 150 years. The first acceleration of trade started in the 1950s, and all the trade in the world grew by about ten times between 1950 and 1980. However, the real boom came between 1980 and 2010. Remarkably, international trade grew by almost 35 times in that period. But the chart also shows, trade has not been growing much in the past years. The global financial crisis in 2008 led to a big collapse in trade. It recovered in the following two years, but then trade dropped again, and since then, trade has basically flatlined. Chart 2, on the other hand, looks at the development of the global stock of FDI between 1980 and 2016. The development has been even starker for FDI than for trade. In that period, the global stock of FDI grew from 0.7 to 25 trillion US dollars. What also makes the three decades between 1980 and 2010 unique is that international trade gradually became global. In the first decades after the Second World War, trade had mostly been about exchange between developed economies or, in practical terms, between countries in Europe and North America. Some countries like Japan joined the bandwagon of international trade in the late 1970s, but the real geographical equalization of trade happened in the thirty years that defined the period of globalization. In those decades, many more countries opened themselves up to trade through reductions of trade barriers and domestic reforms that made it possible to exchange goods and services across borders (for instance, allowing the exchange of foreign currencies) and enter into contracts with foreign firms. As a consequence, they attracted investment from companies in other parts of the world and their international trade grew very fast – indeed faster than at any time in history. Another way to look at the growing role of trade, is to compare the size of the trade sector over time. The trade sector is defined by trade as a percentage of Gross Domestic Product (GDP). For the world as a whole, the trade sector grew from about 25 percent in 1960 to about 58 percent in 2016. The role of trade for GDP thus more than doubled in that period (just like with global trade, the size of the trade sector has decreased since 2010, when it peaked at 61 percent). Some countries have a much larger trade sector than the global average. In Sweden, for example, the trade sector in 2016 was about 85 percent of GDP, and Germany had exactly the same size of its trade sector. A growing trade sector means that a larger part of the workforce today has export-dependent jobs. A study for the European Commission, for instance, estimates that the number of jobs dependent on export to countries outside of the EU has grown from about 18.5 million in 1995 to 31 million in 2011. That is a 67 percent growth, and it is particularly the number of high-skilled jobs that has increased. Yet a larger part of the workforce in the EU works in jobs that exports to other EU countries, which is not included in the above figures. In Sweden, to take one example, the number of jobs dependent on goods exports to other EU countries was estimated in 2014 to be about 1 million – and that is more than 20 percent of the country’s labour supply. Three factors explain the flatlining of international trade in recent years. First, there has been weaker growth of demand for goods – especially industrial goods (e.g. steel and machinery) – that are intensively traded while the demand for services that are locally produced (e.g. healthcare) has increased rapidly. While that development is partly a natural factor of changing demand patterns, the second factor is more noxious: protectionism. Governments across the world have used the period since the crisis to substantially increase the amount of policies that explicitly discriminate against foreign firms (see Box 2). Third, explicit protectionism follows on the heels of a somewhat longer period of increasing regulatory costs of trade (e.g. administrative costs for filing trade documents with a Customs Authority). Chart 3 shows that there has been a clear trend break in regulatory trade barriers in the 2000s (the higher the index score, the greater the trade freedom and the lower the regulatory restrictions). Up till then, the degree of freedom to trade increased. Since then, however, regulatory restrictions on trade have increased substantially. And it does not stop there. In addition to these regulatory costs to trade come, for the services sector, different forms of non-trade regulations that have made cross-border exchange more difficult. For instance, the use of occupational standards that fracture the global services market has increased substantially. There are about 800 occupational standards in Europe’s services sector alone and, in the United States, 25 percent of the workforce now operate under such a standard. Many of them make it impossible to export a service to another country because occupational standards are seldom mutually recognized. Note: Index rates are for subcomponent “Regulatory Trade Barriers” in the total index, including nontariff barriers to trade and compliance costs of importing and exporting. The higher the index score, the greater the trade freedom. Protectionism is on the rise. Both developed and developing economies have for the past ten years substantially increased the number of policies that are harmful to global trade and competition. Global Trade Alert, a trade-monitoring project, has calculated that between November 2008 and November 2017, governments have introduced 6756 harmful measures. Governments have also taken liberalizing measures, but the number of harmful measures outnumber the number of liberalizing measure two-to-one. Most of the harmful measures have been the increase of an important tariff or the introduction of a subsidy that discriminates against foreign companies and distorts competition. While these figures reflect trade in goods, the situation is not much different in the services sector. Take for instance digital policy and attempts to impose measures demanding the localization of data, a serious intervention in the digital economy. Between 1990 and 2016, the number of data-localization measures globally has increased ten times. There are several explanations to the remarkable growth of trade over time, but one obvious factor behind it has been firms and their business development. In a way, the growth of exports is just another way of saying that firms have gradually sold more to foreign customers or that foreign customers have played an increasingly important role for the total sales by the corporate sector. When data is informing us that global trade between 1980 and 2010 grew 35 times, it means in practice that the corporate sector expanded their foreign sales by 35 times. Or to take the example of a single country: Swedish firms expanded their foreign sale from just north of 200 billion SEK in 1980 to more about 1500 billion SEK in 2010. And to drill that down to the level of a firm: In 2010, telecom company Ericsson had export sales from Sweden of 100 billion SEK, which in nominal terms is more than twice as much as Ericsson’s total sales in 1990. Back then, Asia represented about 6 percent of Ericsson’s total sales. In 2010, that share had gone up to 25 percent. As a thought experiment, try to imagine how a company would have evolved without globalization. There is no way to fully understand a counterfactual scenario like that, but it helps us to understand some of the differences in business opportunity between alternative scenarios. And one difference is obvious: if a company only has market access to the inhabitants in its home country (in Ericsson’s case, ten million Swedes) it has to build another type of business than if it has access to the global market. What is more, market size is of particular importance for those companies that produce goods and services that are innovative and have a high intensity of R&D or capital expenditures. If their potential customer base is small, it means that every unit of sales has to recoup a larger share of the investments the firm made in developing and producing a product. The flip side of the coin, however, is that the growth of customers abroad help these firms to spread development and production expenditures over many more unit of sales. Economists call this the scale benefit of globalization – and it is based in basic economies of scale. It has also been one of the tangible benefits for the corporate sector: globalization has enabled them to develop businesses that depend on sales of many units and to many different customers. If Ericsson’s market for mobile technology would be limited to Sweden it would have been impossible to build basic GSM technology or develop the core equipment for 3G and 4G communication. The same logic applies to many other sectors that require substantial development and production costs: automobiles, chemicals, computers, electronics, pharmaceuticals, and more. It is therefore unsurprising that the expansion in global trade during the age of globalization happened to a large extent in exactly these sectors. Another difference between the actual development and the imagined scenario of a non-globalized world is that globalization created opportunities for faster specialization of production and firms. Some would perhaps see that a disadvantage, because gone are the days when an individual firm could build a corporate imperium that produced a huge variety of different products, often behind the protection of trade barriers. Look at Volvo. It is no longer a company that produces trucks, buses, cars, drugs, beverages, and frozen food. Even the automobile division is now split, with one part producing cars and the other trucks, buses and heavy vehicles. Thirty years ago, the Finnish champion Nokia was competing in many markets – television sets, household and paper products, rubber boots, and electricity – and was just about to break in the market for GSM handhelds. Now it is a specialized producer of telecommunication equipment technology. As late as the end of the 1980s, a telephone in Europe was built from the first to the last component in one factory. Compare that with the fragmented supply chain of modern production. At its height in the global handset market, Nokia was estimated to handle more than 100 billion components every year. In 2006, its plants produced around 900,000 mobile phones – and handled around 275 million components every day. Most of these components were procured from other companies – specialized in producing parts and components – and imported to the countries where Nokia had located its factories. A low estimate is that half of the number of components used to build a mobile phone has crossed a border. From one telephone to 100 billion components in less than two decades – this is the story of modern globalisation. Specialization creates business opportunities because it is easier to step into new markets when it is not necessary to be a large entity with strong control over end customers. Markets that are specialized usually have greater space for new companies and they certainly make it possible to compete on the basis of new technology and a good offer. A company that is a skilled producer of automobile engine components does not need to produce an entire car and compete with larger firms such as Volkswagen and Toyota on the end customer market. They can rather allocate all their resources to become even more competitive producers in engine components. That means, among other things, that their resources (e.g. staff and technology investments) can be and become more specialized. It is for this reason that the age of globalization experienced a growth in global trade that, functionally, reflected the breakup of large multinationals into fragmented supply and value chains. No large company has enough resources to become specialized producers in all parts and components that it needs in order to produce a good or service. If companies had to rely on just domestic markets for their sales and inputs, they would not have been able to innovate and develop products in the way they actually have over the past 30 years. It would have been too costly, and – most likely – they would have to produce in ways that, compared with today, would have made the quality of products substantially lower. It is often forgotten how many markets in the pre-globalization era were dominated by expensive products with low quality. And that did not happen by chance; it was rather the consequence of narrow opportunities for business in how they could compete and develop their offerings. Workers have benefitted substantially from the way that globalization increased the premium for scale and specialization. There is a general pattern in the world economy that open economies are much better for workers than less open economies (see Box 4). And the improvements made in open economies partly comes from the fact that the new production they generate depends more on human capital. Workers that have more and better education, and that is better at delivering creative solutions to problems, have higher salaries and better employment conditions. Improving business opportunities benefit workers in the economy. Companies that can better use the various gains from trade – for instance, scaling up and specializing the production – also create jobs that demand higher skills and that are better paid. Moreover, these benefits tend to be stronger in economies that are more open to trade and investment than others. The OECD, for instance, has found that manufacturing workers in more open economies had between 1970 and 2000 raises in pay that were between 3 and 9 times greater than those in more closer economies. In the United States, for instance, exporting firms pay wages that are close to 10 percent higher than in non-exporting firms. For Chile, also a developed economy, the trade premium is even larger: a worker in a sector substantially open to trade earns 25 percent more than a worker in average. In a review of world-class research studies, the OECD found that they all concluded that trade drives up wages. While outsourcing and off-shoring of intermediate production can lead to unemployment for some, wages and aggregate employment are improved. One does not need a Nobel Prize in economics to understand why. Trade improves the way that economies use their human resources. When some parts of the production are off-shored, it means that companies can specialize and invest more in human capital. A substantial part of globalization has therefore been to get labour to be employed in their right places: the part of the workforce in advanced economies that is involved in work with high value added increases constantly. Resources, then, have both been better allocated and freed up for alternative uses. It is no surprise, therefore, that open economies outperform by far other economies in labour rights and working conditions, including working time, fatal incidents, and life expectancy. New jobs created are not just better rewarded – they are safer and, often, more stimulating. Gender equality has improved much over the past half century. While discrimination of women remains a big problem in many countries, globalization has helped to create new economic opportunity for women, reduce gender wage inequality, and generally put a higher cost on those that discriminate in favour of men. Think of female entrepreneurs in poor regions that, for a variety of reasons, have been locked out of the formal financial sector and not been able to access credit or payment systems. Internet and mobile technology – developed in other parts of the world – now give them the opportunity to access financial services and receive payments. For many of them, global online platforms help to access new consumers that they previously could not reach. For instance, while most people know that Alibaba is the biggest e-commerce platform in the world – its revenues are bigger than the combined revenues of Amazon and eBay – few know that the secret to its success has been to connect small entrepreneurs with new customers. Behind the Alibaba brand hides B2B and B2C marketplaces for small producers (many of whom are women) that otherwise lack the resources and scale to reach customers. Similar opportunities are also created by globalization in advanced economies – and research also shows that the new competition that often follows on the heels of trade helps to reduce gender wage inequality. Discrimination is costly because it means that resources are used inefficiently and that firms are not using human capital in ways that make them more competitive. When competition increases, it often gets more expensive for discriminating firms to continue overpaying men and underpaying women, and that is why new import competition tends to drive down the gender pay gap. One study that compared wages over time in US manufacturing sectors found that gender wage discrimination was stronger in concentrated sectors (where a single firm has stronger market power to set prices) than in competitive sectors. However, when concentrated sectors experienced an increase in new trade competition, the gender pay gap was reduced. Equally important, if not more, is that the new business opportunities created by globalization ultimately have resulted in lower consumer prices. For most people, the effective reduction in the costs of consumer products – and, as a consequence, the radical increase in living standards – are likely the most visible effects of globalization. Households in Western economies have today a completely different welfare standard than in previous decades, and much of that is thanks to the benefits generated by freer and more trade in the world. This is not a controversial observation: even opponents of globalization admit that consumer products generally cost less and are of better quality today than at any previous point in time. The way that economists express the same view is that globalization has been a significant contributor to disinflation over the past 30 years. In most Western countries, inflation rates were high in the 1970s and 1980s. Wages increased much faster during those decades than today, but most of that increase did not lead to higher living standards because inflation cancelled out the wage increase. In real terms, after corrections for inflation, wages were rather flat or growing slowly for a long time. Globalization and the new competition that it ushered into Western economies substantially helped to bring down inflation and to increase the real labour income. And, unsurprisingly, the income grew faster in Western countries that are more open to trade than those that are less open to trade. 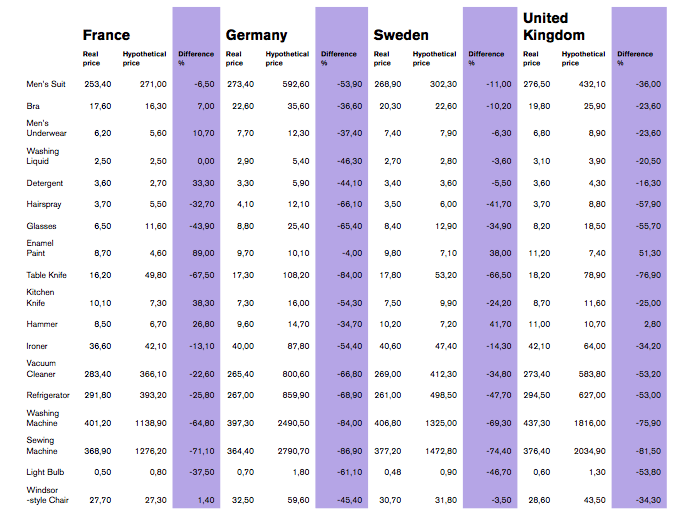 Chart 4 sets out the development of real hourly earnings in the manufacturing sector in four countries in Europe (France, Germany, Sweden and the United Kingdom) between 1970 and 2007, the start of the global financial crisis. Nominal earnings have been adjusted with the general consumer price index (CPI) for each country to provide an illustration of the earnings growth on top of the annual increase in prices of a given basket of usual consumer goods and services. There are differences between the sampled countries, but they have all had periods of weak real growth in wages because of inflation. Whereas the British and French worker saw its real hourly earnings more than double over the period, the Swedish worker really started to be better off only in the mid-1990s – after two decades of high inflation and macroeconomic troubles. In fact, the Swedish worker did not experience any increase of its real wage between mid-1970s and mid-1990s. In France, there was a steep growth between the late 1960s and early 1980s, but then growth flattened. Since the last 1990s the pace of real earnings growth has increased again. Germany, a hawk in matters of inflation, has experienced a fairly constant rate of growth. In the mid 1980s growth was higher than in the 1990s and in recent years. The UK has had a rapid growth since the early 1980s and is the country whose real earnings have grown fastest in this sample. Source: OECD, Labour and Price database. An alternative way of describing the growth of real wages is that consumers now get “more bang for the buck”. For many typical products that a household purchase, it is not just that prices have grown slower during the age of globalization but that prices have declined despite obvious improvements in quality. Take the case of the United States: in 1980, a consumer in America could purchase a 1.3 cubic foot microwave for 399.95 U.S. dollar at Sears, the retailer, but now it can get a microwave of the same size for 57.13 U.S. dollar at Walmart. The standard of the product is actually much better today – and it now comes with many more functionalities. Still, the price of the product – in pure nominal terms – has gone down by 85 percent. This means that the average U.S. worker has to work fewer hours in order to afford a microwave. In 1980, it took 61 hours to get the income required in order to buy that microwave from Sears. The average worker today only has to work three hours to afford a Microwave from Walmart. The same comparison can be made for several other products that have been subject to greater trade and competition. A person with an average U.S. wage in 1984 needed to put in 456 hours in order to pay for a cell phone. A quarter century later, it was enough to work four hours to afford that item. As a consequence, products that in 1980s were luxury items – affordable to only a few – are now part of most households in the United States, and given that households with low incomes spend a greater share of their income on typical household products, the effect has been stronger for them than for households with high incomes. A study of American households shows, for example, that in the period between 1994 and 2005, inflation for low-income households was 6 percentage points lower than inflation for top-income households. A central lesson from the past centuries of increasing trade is that the distributional effects of trade are very strong when expenditure and consumption patterns are accounted for. Households and individuals that are comparatively poor tend to spend a higher share of their income on basic products like food and clothing. Consequently, when the price of products is reduced because of international trade, there is what economists call an expenditure channel effect from globalization to the real income distribution. The size of this gain depends on several factors, but openness to international trade is a key one. According to one central study, there is a “pro-poor bias” of international trade in all countries. On average, the gains from opening up to trade are 63 percent for the 10 percent of income earners with the lowest incomes and 28 percent for the 10 percent with the highest incomes. In other words, the lower the income, the bigger the gain. It was not just increasing global trade that cut the cost of a microwave in the United States (and elsewhere). Other factors, like changes in technology and transportation costs, played an important role for lowering the cost of production or enabling trade. And, generally, the patterns of specialization that growing globalization helped to reinforce led to improved use of resources and new demand patterns that feedbacked into lower costs of goods. Yet growing trade and investment were key factors behind the price development, and all that begs the question: how large part of the increasing living standards that Western households have experienced in the age of globalization can reasonably be described as a consequence of the growth of trade? Unfortunately, the economy is not a subject suited for laboratory experiments, and hence there is no good way to examine what could have happened if the conditions had been different. However, one way to respond to that question is to engage, yet again, in a thought experiment: what would have been the price of a good if it had not been exposed to international trade and competition? The result can be found in Table 1 – and it serves as a proxy for how much globalization has lowered the price of typical household products. We have calculated a hypothetical price for the listed goods – basically, the price of a product if it between 1970 and 2005 had followed the general consumer price development in a country. As can be seen in the column describing the difference in percent between the real price in 2005 and the hypothetical price, or adjusted price, there is a big difference between the two. The hypothetical price is substantially higher than the real price, and the difference is remarkably big in products like refrigerators, washing machines, and sewing machines. These are products that have been referred to as durable or capital household goods, and one reason for that is that a household often needed to borrow capital forty years ago to afford them. For most households in Western economies today, it is not necessary to borrow capital in order to buy a vacuum cleaner – yet that was the reality for the lion part of households in 1970. A sewing machine was not a staple item in a German household in the 1960s, and it probably would not have been if the price of sewing machines had followed domestic rather than international price conditions. The price of a sewing machine in Germany would have been more than seven times higher. Price developments such as these have had a remarkable effect on consumers and their real income. Consumers today get substantially more for their money. Consumer choice and product variation have increased, too, and that has also brought clear economic benefits. Between 1972 and 2001, according to one study, the number of goods in the U.S. economy doubled – from 8000 to 16000 – and the median number of countries for which a good was imported increased from 6 to 12. The greater variety alone has been estimated to increase welfare in America by 2.6 percent. Finally, the income effect from disinflation has generally been strong in Western economies and, at times, been higher than the effect from increasing nominal wages. International trade has cut import costs for both consumers and businesses that buy inputs for their own production and assembly. Greater competition from foreign firms has created additional pressures on firms to constantly search for ways to cut the costs of their products, which ultimately benefits the consumer. Globalization also pushed economic efficiency in the economy, and low-efficient firms generally had to make greater space for high-efficiency firms. The dynamic behind that development is the subject of the next section. Sources: Statistiska Centralbyrån; European Central Bank; Eurostat; OECD; and national statistical offices in France, Germany, and the UK. Economic efficiency may come across as a dry subject, but the forces behind it are everything but plain. Economist John Maynard Keynes once described the “animal spirits” of entrepreneurial competition as the proven way to raise a society’s welfare potential, and that is correct. To compete successfully and deliver more value for money to customers, firms constantly have to chase inefficiencies and promote productive economic behavior. It is when economies increase their efficiency or improve the way they use resources like capital and labour that productivity goes up. And this is important because, for entire economies and Gross Domestic Product per capita to grow sustainably over the long term, there has to be productivity growth. In other words, productivity growth sets the pace for how much more affluent societies become over time. Globalization has increased productivity in Western economies over a long period of time, but that relation has not always been obvious from a cursory look at Western productivity, at least not in recent times. Productivity growth is defined by many different factors – international trade and investment are just one – and for some time there has been a gradual slowdown in the growth of productivity in Europe and North America. While some of that slowdown may be related to trade, there is much evidence suggesting that factors such as stiff labour markets and the low tradability of services are key culprits. For instance, productivity growth in the trade sector remains substantially stronger than productivity growth in the non-traded sector. The contribution of globalization to productivity growth is a reflection of the way that trade and investment have created new business opportunities. Economies of scale and specialization have led to a much better way of using resources in the economy, and as a consequence of these forces of trade, the standard indicator of productivity – labour productivity – has increased. The orientation of firms towards fragmented value chains has boosted productivity by cheaper imports of inputs. The exact contribution of globalization to productivity growth in Western economies is impossible to determine with a high degree of precision. While a rich body of research has empirically proven that link, it varies much between countries and over time depending on factors that are both related and unrelated to trade (e.g. the degree of trade openness, the size of the trade sector and the flexibility of the labour market). Likewise, it is also known that the increased product variety that globalization has enabled has prompted improvements in productivity. Between 1994 and 2004, this factor alone has been estimated to account for 15 percent of all productivity growth. However, there is one element of the relation between globalization and productivity that yet has not been covered and that is very important. And it is about how trade lead to faster diffusion of technology and innovation. Look, for instance, at how the smartphone quickly became a key product in many parts of the world and imagine what time it would have taken without globalization. When the telephone was introduced, it took 75 years for it to reach to million users. The radio needed 38 years to reach the same number of users – and, later, the television cuts that time by a half. The Internet, though, needed only 4 years to get 50 million users. While there are several causes behind the faster diffusion of new goods and services, exchange across countries is obviously a key one. Ultimately, the ever faster spread of new technology means that businesses and consumers sooner can get access to better products and production methodologies. If consumers in a country were saddled with the technology that had been generated inside that country alone, their technological standard – not to mention the living standard – would be very different from today. For most developed economies in the world, the technology they are using has, as a rule of thumb, been developed somewhere else – and without access to it, their welfare would be substantially lower. The number of hours that the average U.S. worker would have to put in to afford a cellphone would be closer to those 456 hours that were necessary in 1984 than the four hours needed today. International trade, some argue, pollutes the environment because of the carbon emissions that come from the transport of goods, and therefore it is much better that people buy local goods. And it is true that trade is a source of carbon emissions, not just through transport but also because trade boosts output and economic growth. Yet the alternative is hardly better. While people in Europe may for a variety of reasons prefer to buy local food, it is far from certain that it will reduce carbon emissions. Buying apples in Europe just after the autumn harvest is better than buying them overseas, if carbon emissions is the only yardstick. But the substantial part of the food we consume in Europe requires emissions in the production that outweighs the total emission from production and transport when we buy from the Southern hemisphere. The energy that is necessary to produce food in Europe is a far bigger source of carbon emissions than the transport. Buying cut flowers from Kenya rather than Holland or broccoli from South America rather than Continental Europe cuts carbon emissions. Hence, trade is a method to economize with natural resources. Equally important, trade is also a way for countries, businesses and people to get access to new technology that reduces energy consumption and carbon emissions. Imagine what it would be like for a European country to reach its climate targets and the Sustainable Development Goals – without access to technology from other countries. A strategy built on closed borders would be unaffordable and countries would be saddled with technologies that are inadequate. Solar panels and wind mills would exist in just a few countries, and electric vehicles would be a luxury for the rich. Transfer of technology is powered by trade between countries and, without such flows, past and future achievements in greening the economy would not be possible. There are several direct and indirect effects of globalization on a country’s technological capacity and the intensity by which technology is applied in the economy. At the macro level, international trade and investment boost productivity growth by helping economies to get closer to the productivity frontier – those countries that are the most advanced users of technology. That process happens through a variety of means. Obviously, countries can import technologies that they cannot produce themselves, or that would take up a lot of resources to imitate. Moreover, investment by multinational enterprises tends to drive up the productivity in the sectors where they are active. While such direct effects traditionally have been considered important for trade and investment between countries with significant technological differences – e.g. North-South trade – modern economic research clearly shows its importance for economic exchange between developed economies. Intra-industry trade, for example, is known to lead to great technology diffusion because the importing country already has an industrial readiness for employing new technology. Moreover, globalized supply and value chains generally accelerate the spread of new ideas, technology and production methodologies, partly because partners in these networks tend to cooperate to develop new technology. Trade and investment also improve the technology of sectors and economies by forcing greater competition upon incumbent firms. Economies with a high degree of openness and that attracts both foreign exporters and investors tend to have their inefficient firms being outcompeted by efficient firms. The pattern in Europe and North America is that there is greater productivity and technology variation within their own sector than it is between sectors in similar countries. In other words, the productivity of firms in, for instance, the U.S. manufacturing sector varies more than it does between the average firm in that sector and the equivalent sector in Western European countries. In the United States, the top ten percent of firms in productivity are twice as productive as the bottom ten percent of firms. In Europe, the top ten percent firms are three times as productive as the bottom ten percent. Importantly, trade and investment help to diminish that gap between the more and the less productive firms. Expectedly, open economies are generally closer to the productivity frontier and have a smaller productivity gap than other countries. Open economies have a greater degree of competition, which makes it harder for low-productivity firms to survive. They have a bigger presence of foreign firms and FDI plays a greater role for their economic performance, and those factors generally have a positive effect on the level of productivity. Moreover, they participate with greater intensity in production networks and have more firms that have to be at the frontier of technology and innovation. Lastly, they are under greater pressure to innovate. It is well documented that trade increases the need for firms to be competitive and employ new technology. This effect of trade alone has a positive and strong effect on the behavior of the economy. Studying half a million firms in twelve European countries, a group of economists found that trade with only one country, China, had contributed significantly to the health of Europe’s economy. Import competition from China pushed European firms to invest more in R&D and information technology, and the productivity of these firms went up substantially. Equally important, that trade also contributed positively to the reallocation of labour between inefficient and efficient firms in Europe. Between 2000 and 2007, increasing trade with China accounted for about 15 percent of all technological upgrading in these firms. Yet there are also indirect effects on technology and productivity from globalization. They can be described as “spillover” effects on the rest of the economy, and they tend to be very important. Such effects occur, for example, when domestic firms imitate foreign firms that have established in their country. Competitive multinational firms usually push domestic firms to perform better. They can bring new technologies and production methodologies that other firms will imitate. The management skills in multinational firms can be transferred into the domestic economy for the simple reason that people move between jobs. According to one estimate for the U.S. economy, that effect account for about 15 percent of productivity growth in firms between 1987 and 1996. Closing the gap between frontier firms and non-frontier firms is the chief economic task for most Western economies today. What is striking about productivity growth – and its slowdown – in affluent societies is that the differences in productivity between firms inside a sector in one single country are bigger than differences between sectors in different countries. And the explanation for that is to a large extent based on how much exposed a firm is to international trade: firms with low productivity are not much part of the globalization process. They are less exposed to competition, have fewer managers with international experience and are slower to imitate the high-productivity firms. They are not skilled at attracting advanced human capital. Globalization is in several ways a learning process for firms – they gradually figure out how to improve their products and production – and it is these experiences that improve the quality of labour and the efficiency with which investors and companies operate. There is no data on the global stocks of FDI before 1980. Data comes from the World Bank’s Data Bank. Data from Statistiska Centralbyrån (SCB), the Swedish statistical office. 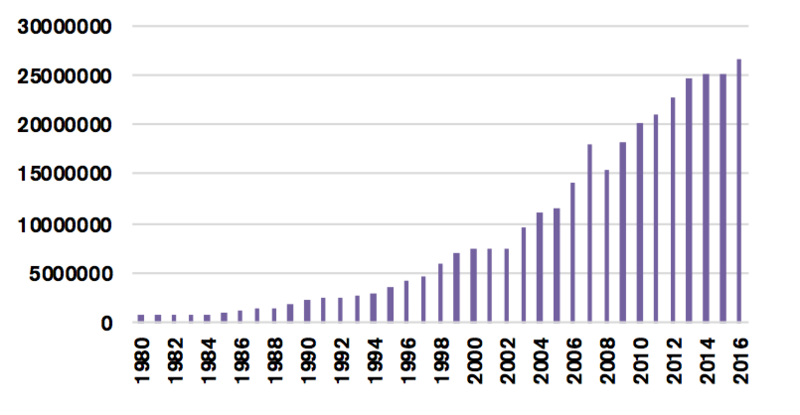 There is no comparable data on the exports sales from Sweden by Ericsson over time. The export sales data for 2010 is from Ericsson’s Annual Report in 2011. The total sales figure for 1990 is from Ericsson’s annual report in 1991. Data on the growth of global trade in different sectors is from the World Trade Organization’s Statistics Database. Data for the microwave example comes from the U.S. Bureau of Labor Statistics. The methodology behind this calculation is: 1) We have selected a sample of typical household products that have gone through substantial changes in where they are produced and how they are traded internationally. 2) We have collected the actual prices for these products in both 1970 and 2005 – and we do that for four countries: France, Germany, Sweden and the United Kingdom. The 1970 prices are based on Erixon & Lewander, 2005, which collected real prices for the products for Sweden. The real prices for similar goods in 2005 were collected for each country. When collecting the prices for comparable goods in 2005, we have chosen individual products of slightly higher “standard” than the goods from 1970. This has been done in order to avoid an overestimation of the price effect. For example, if we had used the 2005 price of a men suit from low-price H&M, the effect would have been even greater.3) We have used the nominal price in 1970 as the basis in a counterfactual scenario for how the price of that product would evolve up to 2005 under the assumption that it would develop in accordance with the general consumer price index. In other words, this hypothetical price of the product that is calculated would reflect domestic price conditions rather than international price conditions (through trade). The consumer price index does not only represent the domestic price development, but it is in this case a better price index than the GDP deflator or the producer price index. We have adjusted it by “cleaning” the CPI from import. Standard, annual CPI’s have been cleaned by using the annual import value index from the OECD for each country, adjusted for the import penetration. 4) Then we compare the actual or real price in 2005 with the hypothetical price for 2005. During some periods, income inequality in Western economies has grown while consumption inequality (when living standards are corrected for prices and patterns of consumption) has not. See Broda and Romalis, 2009b, for evidence. OECD, 2015; Yahmed and Dogherty, 2017. For a research overview, see OECD, 2015 and Mallick, 2013. A cell-phone is not a smartphone, and it would take the average U.S. worker more than four hours of work to afford a smartphone. Intra-industry trade is when two countries export and import with each other in the same product category. Intra-industry trade is more prevalent in trade between countries of high economic development than in trade between countries with different levels of economic development. Globalization means different things to different people, and for some it is a catch-all word for everything in society they think have developed in the wrong direction. In essence, however, globalization is about expanding the role for trade, foreign direct investment and other forms of cross-border exchange in national economies, and for most societies that therefore means that globalization is one of the factors that determine what type of output that is produced in a country. In that context, the age of globalization between 1980 and 2010 has been hugely positive for developed economies and delivered economic and societal improvements at an unprecedented pace. Globalization has created new opportunities for firms to develop business models and offerings that have a higher intensity of R&D, innovation and capital. Many of the goods and services that have entered the market over the past decades have exactly those features, and without globalization, firms would have been forced to continue with business models that work with a smaller volume of sales. Firms have been able to specialize more than before and, as a consequence, human capital and the share of skilled jobs in the economy have grown remarkably. Today, advanced economies have a greater share of better-paid and better-skilled jobs than ever before. Globalization has increased real wages for people in Western economies by making products cheaper or reducing the pace of price increases. If the typical goods that every household purchases had followed domestic rather than international price developments, consumers would have been poorer and saddled with products of lower quality. Globalization has made significant contributions to productivity growth and, as a consequence, further raised living standards. Globalization has been particularly important for enabling new technology to spread fast across markets. In the long term, it is the speed of technological improvement that sets the pace for how richer societies get. However, trade and investment are not growing fast anymore, and there is much suggesting that the decline in trade and investment growth is one explanation to the failing dynamism of Western economies. While some appreciate the decline in the growth of globalization, those who care about the prosperity of a society should deplore it and make efforts for the world economy to return to high levels of trade growth.